Paradise Papers Links APRIL’s Tax Avoidance To Deforestation And Banks, Impacts $500M Loan? As published by Chain Reaction Research, Asian Pacific Resources International (APRIL), one of the world’s largest pulp-and-paper companies, has been linked to deforestation in Indonesia. With the leak of the so-called ‘Paradise Papers’ this week, further information about APRIL’s financial backers have been revealed, leading to more questions about whether banks such as ABN AMRO follow their own sustainability policies and how global corporations may use tax engineering to increase funds available for deforestation. The Paradise Papers, 13.4 million files leaked from offshore law firm Appleby, demonstrate how global corporations move money to tax havens to avoid taxes and other government regulations. Last week, the International Consortium of Investigative Journalist (ICIJ) published a report based on the Paradise Papers that analyzes Asia Pacific Resources International (APRIL) and its lenders, one of many Asia-based companies in the forest sector that used the law firm’s services. Records from Appleby support previous statements from advocates, researchers and government officials that the global financial system’ use of tax havens has expanded access to resources for companies involved in deforestation and other practices linked with climate change. These fears are especially pronounced in Indonesia, which has both the world’s highest rate of deforestation and its third-most land covered by tropical forest. Do APRIL’s Banks Face Reputation Issues for Continued Lending? APRIL expected responses from potential lending banks by November 7th for a USD 500 million loan for Asia Symbol, its privately-held subsidiary. But the Paradise Papers may raise reputational issues for financiers who do business with the company, which was found in 2016 by the Government of Indonesia to have logged peatlands on Padang Island in violation of Indonesian law. As described by ICIJ, APRIL pushed lenders to loosen environmental standards on a USD 600 million loan in 2011. Some of APRIL’s lenders, shown in Figure 1 (below), have detailed lender criteria for the pulp, paper, rubber and palm oil sectors. Given past allegations, potential lenders would have to conduct detailed due diligence to ensure that APRIL is not in violation of these lenders’ lending criteria. Figure 1: Previous Lenders to APRIL’s Subsidiaries. Source: Bloomberg. One of these prior lenders was the Dutch bank ABN AMRO. If ABN AMRO continues to lend to APRIL and its subsidiaries and participates in the loan, as shown in Figure 2 (below), ABN AMRO should consider extra efforts via due diligence and other activities to mitigate the risk that lending to APRIL may violate ABN AMRO’s lending standards. ABN AMRO’s lending standards are described in its Sustainability Sector Policy for Agri Commodities, which covers forest commodities including pulp, paper, rubber and palm oil. Likewise, last November 2016, civil society engaged APRIL’s lender Credit Suisse to address APRIL’s allegedly illegal peatland clearing. The environmental coalition Jikalahari and local communities from Riau province sent two letters Credit Suisse and ABN AMRO describing their concerns. In December 2016, WWF and Greenpeace ceased working with APRIL also because of its allegedly illegal peatland clearing. The Sustainability Policy Transparency Toolkit (SPOTT)’s timber, pulp and paper company assessment launched November 9 ranks APRIL second globally out of 24 timber, pulp and paper companies supply chain policies and overall environmental, social, governance criteria. SPOTT’s analysis used APRIL’s 2013-2014 sustainability report. It is important to note that these policies may not translate to into implementation on the ground. SPOTT’s mandate for its analytical process did not include addressing tax avoidance and the use of tax havens and secrecy jurisdictions, as described in the Paradise Papers. In the meantime, there are no documents or loan covenants available via Bloomberg stating if this USD 500 million loan to APRIL’s subsidiary will apply prohibitions against sourcing pulp and paper linked to deforestation and if the funds will not be used potentially illegally to drain Indonesia’s peatlands, contrary to Government of Indonesia policies. Figure 2: APRIL’s Subsidiaries and Their Pending USD 500 Million Loan. Source: Bloomberg. As shown in Figure 3 (below), Royal Golden Eagle Group (RGE Pte Ltd.), which is owned by Indonesian billionaire Sukanto Tanoto, owns APRIL. RGE employs 60,000 people globally producing palm oil, paper, and other products. Figure 3: APRIL’s Corporate Structure (note – this diagram is simplified and does not include all subsidiaries. Source: Bloomberg. APRIL manufactures and supplies fiber, pulp, and paper. The company offers bleached hardwood craft pulp, office papers for printing and copying tasks, and white papers. 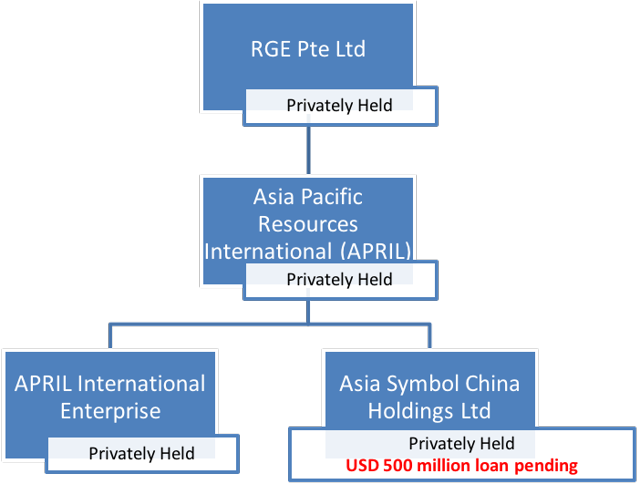 Note that other RGE and APRIL subsidiaries are not described in this simplified diagram. Two of APRIL’ssubsidiaries are highlighted in Figure 3 (above). They are APRIL International Enterprise (formerly known as Heliosity Consulting) and Asia Symbol China. Asia Symbol manufactures and distributes paper products. It mainly produces converted paper products and it serves customers in Hong Kong and the greater China region. APRIL International Enterprise manufactures and supplies paper and it serves customers in Singapore and SE Asia. Given these concerns, ARPIL’s financiers should monitor APRIL’s land bank for any illegal clearing, development of contested land or other lending policy violations. Author: Gabriel Thoumi, CFA, FRMGabriel Thoumi, CFA, FRM, is part of Chain Reaction Research, a coalition that includes Aidenvironment, Climate Advisers and Profundo. Chain Reaction Research is funded by the International Climate and Forest Initiative (NICFI) scheme managed by NORAD and the Packard Foundation. Chain Reaction Research does not necessarily reflect the standpoints of NORAD or the Packard Foundation. Gabriel Thoumi, CFA, FRM works as Director Capital Markets at Climate Advisers where he manages global financial analytics focusing on mitigating systemic climate risk while advising on “greening” capital markets. He has 18 years of experience managing and deploying frameworks to improve global capital markets sustainability through risk mitigation and return enhancement. Previously, for Calvert Investment Management, he valued global equity, index, and fixed income portfolios and their component positions in the utilities, energy, materials, chemicals, and financial sectors. He worked on quantitative index construction and asset allocation strategies. He engaged Fortune 500 CEOs on approaches to mitigating climate risk using financial risk management tools. He led initiatives to improve financial accounting of exchange-listed products and incorporated natural capital into financial tools. He has also worked at Morgan Stanley's carbon offset company, Wells Fargo Capital Management, and American Express. He is an adjunct at John Hopkins University.